Need a way for customers or members to submit pictures? The struggle in doing this is that using a form upload on your website can cause issues if the files are too large. If images are shared on Facebook, Instagram, or other social networks, the images are optimized and compressed to the point where they would not be usable for print. 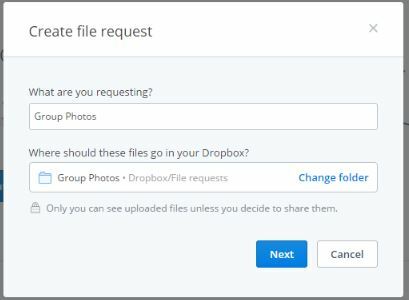 Dropbox has a feature called file requests that allow you to create a custom upload link and then share that with your group; and it takes just a few seconds to setup. If you don’t have a Dropbox account, get that setup quickly and take advantage of their free account level allowing you up to 2GB of online storage and file sharing. If you already have an account or once you have created one, visit dropbox.com/requests to setup your link. Create a label for what you are requesting. If this will be a new section of your Dropbox account, a new folder of that name will be created automatically. If you want to get fancy, you can create a simplified link like johndoedesign.com/sharing at your domain that redirects to the Dropbox link or you can use Google’s URL Shortener to simplify it. See? That was easy! Happy sharing! Dropbox Public Uploads Overall rating: 5 out of 5 based on 6 reviews.